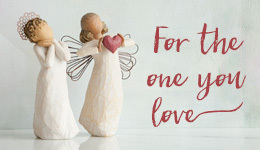 This special Willow Tree® angel figuring is all about communicating you were loved. A great little piece to commemorate a loved one's memory with the sweet angel holding a red heart. This angelic figurine is dancing, twirling and her gesture is the message. The movement of her dress, hair and hands communicates you are loved. Personalize 1 name on the side of her dress for a custom presentation. Includes gift box and ready for gift giving. Easy care: Dust with soft cloth or soft brush and avoid water or cleaning solvents.